Are the Thumb Tips on the market too small for your thumb? Isn’t it disappointing when you can’t perform a Thumb Tip effect because you can’t find anyone that fits your thumb? VERNET has the solution!!! 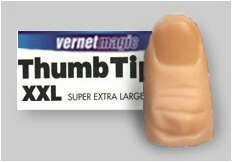 : The new XXL super large thumb tip. The best choice for people with larger thumbs or needing more space in the tip.